Over the last three decades rap music has developed into an important music genre in Taiwan’s music scene. Thus Taiwanese rap emerged in the aftermath of democratization. The use of rap music has been surprisingly common in Taiwan’s political communication. Political rap music has a reputation for being subversive, well-illustrated by Public Enemy’s call on listeners to "Fight the Power." 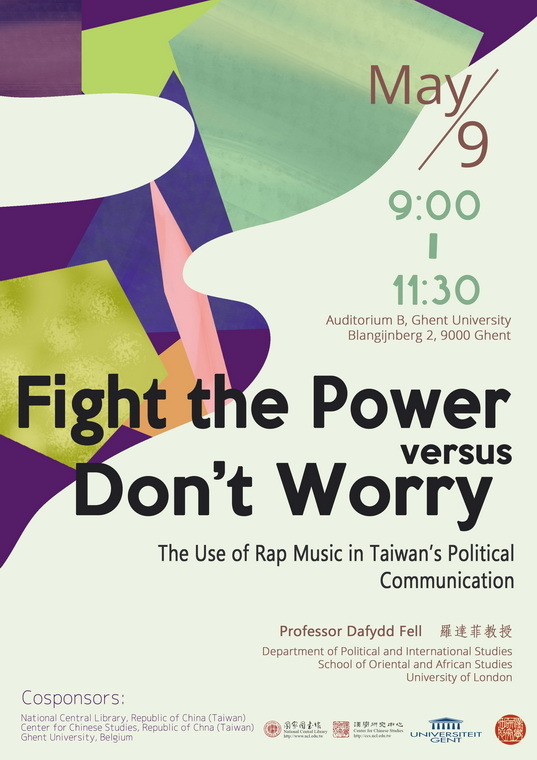 This lecture considers whether political rap in Taiwan fits in with the stereotype of being oppositional to the state. We do this by analysing five political rap songs that span the arrival of rap in the late 1980s through until recent times. We show how rap has been used not only to fight and satirize power but it has also been used as a campaigning tool to try to gain power. Moreover, political rap has also been employed by the state to try to connect better with younger voters and also as a means of public information campaigns. In addition to considering the uses of rap we offer some discussion on how to measure the effectiveness or success of these rap songs. Prof. Dr. Fell is the Reader in Comparative Politics with special reference to Taiwan at the Department of Political and International Studies of the School of Oriental and African Studies (SOAS), University of London. He is also the Director of the SOAS Centre of Taiwan Studies and the book series editor for the Routledge Research on Taiwan Series. In 2004 he helped establish the European Association of Taiwan Studies. He has published numerous articles on political parties and electioneering in Taiwan. His latest book is Government and Politics in Taiwan (Rouledge, 2011). He has a new co-edited volume titled Migration to and from Taiwan (Routledge, 2014).